Info: Created on 21st April 2008 . Last edited on 30th October 2009. Sweet font. The sample really sells it. Thank you for bringing a smile to my face. The readability is remarkable, considering it`s black & counterless nature. Congratulations! FontStruct Staff have deemed your FontStruction worthy of special mention. 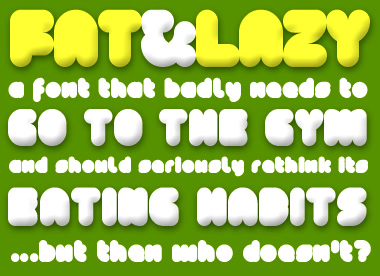 “Fat&Lazy” is now a Top Pick.